Ladyjustice was fortunate about 30 years ago to participate in two separate six week training programs for new homicide survivors offered in Greater Hartford by a special Victim-Witness Support Group. During the module dealing with the court system, a unique and wonderful bilingual publication served as a bridge for understanding for children. 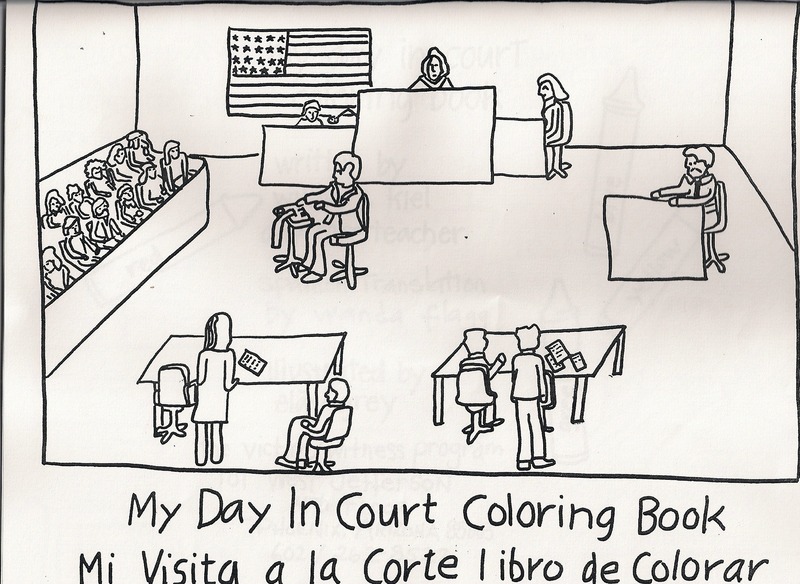 This timeless book is called: “My Day in Court Coloring Book. (En Español- Mi Vista a la Corte Libro de Colorar). Author, Wilma S. Kiel, Day Care Teacher; Illustrator Elay Grey, Translator, Wanda Flag and sponsor, the Victim Witness Program of Phoenix, Arizona have taken a mysterious venture and made it tangible and understandable on a basic level. 3) Introduce the child to their potential scary role of testifying before a jury. The content of the book includes identification of the exterior court building, the layout of the courtroom (seating arrangements, etc. ); key terminology, the role-definitions of court staff; has an illustrated quiz, crossword puzzle and glossary of terms. And lest we forget “a joke page” just to see if kids are paying attention! This blogger guarantees that adults and children alike will be delighted with this coloring book! And… this primer definitely “softens the blow” regarding the traumatic experience of having to actively participate (testify) in the court process. Kudos to Wilma, Elay, and Wanda for their fine work! Another benefit is that it is easily reproduced via photocopy or your local printer. If Ladyjustice had her way, this coloring book would be “required reading”, re-printed and mass produced for every courtroom, child advocate’s office, victim- witness program, domestic violence shelter and elementary school in the country! 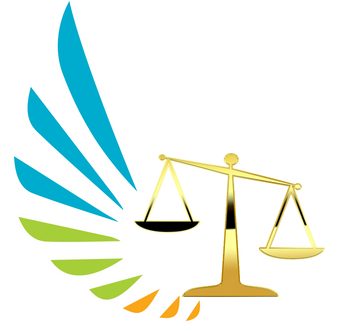 “The Victim/Witness Program provides assistance to the witnesses appearing in Superior Court Criminal Cases. An objective of the program is to involve the community in the ongoing efforts to improve the Criminal Justice System. 1) The New York City Civil Court offers “A Visit to Civil Court,” a 15 page coloring and activity book in PDF version, in French and English which is available for downloading at: http://www.courts.state.ny.us/courts/nyc/civil/kids.shtml. Content includes: Connect the dots; word puzzles; word search; court scenes in which to color; activities to solve and a matching game. In addition, a “new” “Play the Court’s Memory Game” is linked to their website. A link called “Court Classroom” features more word games, puzzles and quizzes for children of varying ages. 3) “How I Feel, A Coloring Book for Grieving Children” by Alan D. Wolfelt, Ph.D. is geared toward very young children ages 3 to 8 years. This book includes 20 pages of illustrations focusing on feelings of loneliness, being scared etc. Currently, it is out of print. The “Learning about Justice Initiative” is an international project including a series of three coloring books: [Learning about Law; Learning about Judges, Learning about Responsibility]. The project is the first National Awareness targeting primary School Students initiated in Waukegan (Lake County) Illinois. The three coloring books are based on U.S. Law Day and the brainchild of Robert Zastany, Executive Director of the Circuit Court of Lake County, Illinois following a volunteer court assignment in Kosovo in 2009. Such an undertaking had many purposes such as: acquainting children in Kosovo about all aspects of the justice system in the United States; providing a “civics lesson” geared for second and third graders as in, buckle up for safety in your car, attending to pedestrian crosswalks, paying bills on time, being a good citizen etc. According to an article by USAID NSSC, courts throughout Kosovo distributed nearly 20,000 coloring books within nine different municipalities beginning on International Children’s Day- June 1, 2010 through 2011. Model Court Liaison, Florije Manaj-Zogal, leader of the Initiative in Kosovo, reported that thousands of students and hundreds of teachers have learned and incorporated such knowledge into their own curriculums for years to come as a consequence of this project. The actual creative work was conceived by a Kosovo based University student art competition. Members of the judging committee were comprised of Mr. Zastany, a Director of Judicial Education from New Hampshire, and a Court Manager from Vermont… The winning designs were completed by Kaltrine Alija, a Graphics Design and Marketing student from Ferizaj. As stated in an earlier blog, coloring brings a sense of comfort and contentment… even to adults (Refer to “Listen Up, Because Time’s Up” Blog). If we really have to subject children to the evils and realities of our society and the criminal justice system at such tender ages, then we may as well prepare them in a manner they can understand!